Match Point is a smart and fun tactical board game with plug & play rules: place your tiles well and score! Place your tile smart and score ! Match Point is a smart & fun game for all. Combine the tiles to get the highest number of points in each turn and win the game. Challenge each other to attain the highest score! The players need to connect the colours to score. Each tile has 4 parts with a colour and a number of spots on them. Connecting two or more colours by placing your tile gives you the number of dots on the sections which are connected by your move. The more colours you connect, the higher the number of points. Since the tactical boardgame Matchpoint also has special joker sections, it is even possible to make a chain of scoring colours. Try it out yourself and you will be amazed about the possiblities. Matchpoint is fun to do, educational and challenging. You learn your mathematics faster, learn to combine too and therefore Matchpoint is also highly suited for children in the age of 6-12 years and the game is being used at many schools for this purpose: Smart & Fun game play! Madelief van Tol, the 11-years old designer of the game Matchpoint has presented the new tactical boardgame Matchpoint to the audience during the Spellenspektakel event in Eindhoven. The main game event in the Benelux. Check out the special report of the News TV. Madelief has designed the game with her father Hans van Tol, a famous game designer who has created several succesfull and awarded board- and cardgames. 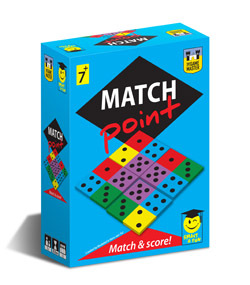 Match Point is the second game from the Smart & Fun game line, which has been published by the Dutch game publisher The Game Master. In the domestic market, the first Smart & Fun game is the Dutch game Apenjungle designed by Reiner Knizia. The Smart & Fun games can be recognized from the specific logo with the smart smiley. Characteristics of these games: Plug & Play rules, game set up within 1 minute, duration of play max. 30 minutes and a budget price. The simple game set up makes this game easy to learn and play for players aged 7-99 years. How to get your copy of the Matchpoint game? In the Benelux game publisher The Game Master BV distributes the game and it is available in all hobby and game shops. Customers outside the Benelux may contact this list of shops or contact your local shop if they can order the game. Distributors interested in selling Matchpoint and other games from The Game Master, please send us an e-mail. We will always reply to your requests. Check out our organisation and contact us. Download here the Match Point-page from our game catalogue. If you like this game from The Game Master, try out Apenjungle or Black Cat. And if you want to puzzle more with economic stakes in the game, we would advise you to check out Skyline of the World or Section X.